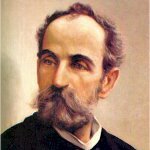 Eugenio María de Hostos (Januayry 11, 1839 – August 11, 1903) was a Puerto Rican philosopher, educator, lawyer, sociologist, but he became famous as an independence advocate. Spain refused Puerto Rico to become an independent country in 1869. De Hostos joined the Cuban Revolutionary Committee in the U.S. and began to promote the creation of an Antillean Confederation between Puerto Rico, Cuba and the Dominican Republic, but people didn't embrace his idea of becoming revolutionaries and preferred to be annexed by the U.S. When Puerto Rico became an unincorporated territory, de Hostos promoted his idea of an Antillean Confederation in different countries (among them were France, the United States, Peru, Chile, Brazil, Argentina and others). But his ideas were not supported. Although Eugenio María de Hostos couldn't do anything for Puerto Rican independence, his birthday is celebrated every year. Also a local international airport, university and school of law in Puerto Rico are named after him.